HDR, or high dynamic range photography is a wildly popular technique for combining several exposures of the same scene to capture a wider range of brightness levels than you could with a single picture. It's built into some imaging devices (like the iPhone's camera) but it's more often used post-capture by photographers who 'bracket' several exposures and combine them with software like this. 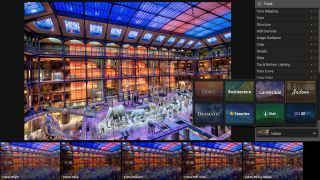 In this instance, MacPhun has teamed up with renowned HDR photographer Trey Ratcliff to produce Aurora HDR, combining its own software processing with Ratcliff's experience and passion. HDR images can range in style from the naturalistic, so that you don't really notice the image has been processed at all, to artistic and dramatic, where the HDR effect is an integral part of the image. And MacPhun reckons it covers the whole spectrum with its range of one-click preset effects. You're not restricted to these presets, though, because they're backed up by a wide range of manual HDR tools – each preset is simply a set of adjustments you can tweak, add to or replace at will. It also offers layering and masking options, so it's possible to apply effects selectively to different parts of the photo. Aurora HDRs presets cover a wide range of subjects from landscapes to interiors, and can be naturalistic or dramatic. The Standard version works as a standalone application – you choose the set of images you want to blend using the Mac Finder, then export the finished HDR image as a new file. It can work with JPEG, raw and TIFF files. The Pro version adds plug-ins for Lightroom, Photoshop and Aperture, and here you can export selected images straight to Aurora HDR. In both cases, a window previews the images you've selected and offers checkboxes for alignment, ghosting and chromatic aberration. If you've used a tripod you probably won't need the alignment option but the others could still prove useful. Aurora HDR will be available from November 19th on the Mac App Store at an introductory price of $39.99 (about £26/AU$%) before reverting to its normal price of $49.99 (about £33/AU$70). Aurora HDR Pro will be available direct from www.macphun.com at a price of $89.99 (about £59/AU$126) before reverting to its normal price of $99.99 (about £66/AU$140).